Store owners could be denied by Stripe for the nature of the product, such as cannabis paraphernalia, pseudo-pharmaceuticals, guns, weapons, gambling or a variety of other reasons. The Stripe account must be separate from Shopify Payments in order to store customer's credit cards on the account. This is because they don't have a built-in way to vault credit cards, so it needs to be a separate payment processor account, such as Stripe, Authorize.net or Braintree. Shopify Payments can still be used for regular one-time orders and just have subscription orders go through the separate Stripe account. For more information, check out our page on Payment Processors. All payment processors we integrate with are PCI compliant, fully encrypted, and are regularly audited by third-parties. Stripe will be depositing the money you receive from subscription orders into your bank account directly. ReCharge does not offer Stripe testing credentials for security purposes. Originally, we allowed for test API keys, but a lot of store owners would put in the test keys and launch their sites. This results in no one being able to check out, essentially wreaking havoc. Because of this, we validate the keys and purposefully block any test stripe API keys. Live stores: ReCharge does not offer Stripe testing credentials on live stores for security purposes. Originally, we allowed for test API keys, but a lot of store owners would put in the test keys and launch their sites. This results in no one being able to check out, essentially wreaking havoc. Because of this, we validate the keys and purposefully block any test stripe API keys. Development stores: ReCharge can enable the use of Stripe testing credentials on development stores only per your request. Please note, this is only an option for development stores using testing credentials, in which both the store and the Stripe credentials cannot and will not ever go live. You may contact Support here if you'd like to place a request for testing credentials to be enabled. The cost of Stripe is $0.30 per transaction plus 2.9%. Attention: New users signing up after May 5th 2017, we are proud to offer an even faster and simpler method of connecting to your Stripe account! 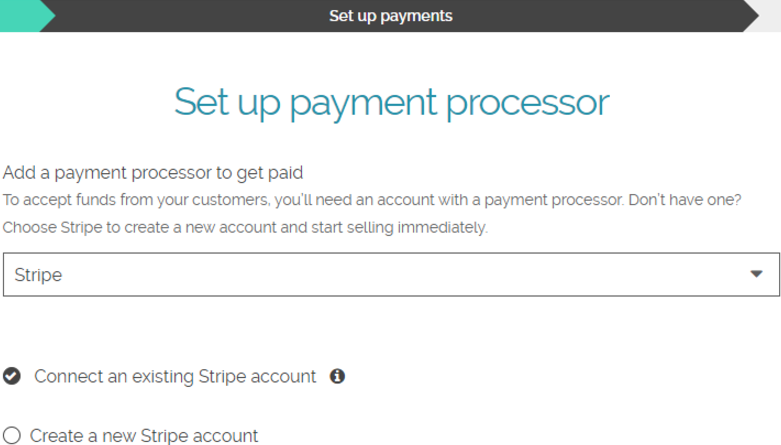 On the sign up page, once you get to the payments step, you can choose to Connect an existing Stripe account. Once you click Next you will be presented with the blue Sign in button pictured below. Once you sign in, it will automatically sync Stripe data! If you signed up before May 5th, please proceed with the steps below to connect. Skip this step if you already have a separate Stripe account set up. Create a Stripe account on their website and log in by entering your created email and password. Once logged in, click Activate Your Account in the top left and enter the requested information. Within Stripe, click API on the left menu. Alternatively, you can click here to get to the API key page. Then copy the Live Secret Key and the Live Publishable Key. If you need to manually add in Stripe Keys due to a change, or for whatever reason, you can send them to us as a support request, so that one of our stellar Customer Service Representatives can paste them in for you. Note: Ensure your currency is set to the same value on each of your accounts (processing, Shopify, and ReCharge). If your account is set to a different currency, this will result in customers being charged incorrectly. If your customers get a new card from their banks, they have to manually re-enter it or the service stops working. Update: Now Stripe has released an auto-update feature. Now, when you save a customer with Stripe, their card will continue to work even if the physical card gets replaced by the bank. More information can be found here. Although we do recommend Stripe, we also have an option for accepting payments via PayPal by using Braintree, which handles credit card and PayPal payments. Check out our article on how to Set up Braintree. If you are unable to use Stripe, you could also consider checking out our article on how to Set up Authorize.net as an alternative credit card processing service. Stripe allows for additional countries in beta stages. You can view their website and/or contact them for more information.